Mahsharaf - Khanom became an educated and conscious person thanks to the education she received from her family and also a position that her parents and grandparents had on both sides of the parents. In Ardalan and its capital, Sanandaj, as a center for the development of culture and education, Islamic and historical, in addition to a strong base, a large group of historians and intellectuals was found that significantly influenced Mahsharaf-Khanom's thought and consciousness. Mahashraf-Khanom, by recognition of many the researchers , was the only female historian in the Middle East in the 19th century. She was the only woman in the period who, along with the author of poems, practiced Islamic studies with great ability and had writings and compositions. In the beginning of the 19th century, the Iranian authorities, in particular, influenced the Ardalanian Kurds and changed their Sunni sect to Shia al-Jaafari. When they felt resistance, they imposed their authority and took control of the government directly in the emirate. They briefly removed it from existence. The Emirate of Ardalan, as part of the South - East Kurdistan, in addition to it was formed in areas, which later became under the control of the Emirate of Baban for more than two centuries, and became the source of disputes and conflicts between them and it came to the occupation of the land and cities, but despite the oppression of the Occupiers of Kurdistan, especially at the end of the 18-th century and the beginning of the 19-th century, there was a strong convergence and diverse integration among the population of the both Emirates and even the ruling class. Finally, when the dyanasty of Ardalan went to fall, Mahsharaf-Khanom and a few thousand Ardalanis moved to the capital of the Emirate of Baban, where they were received with great hospitality. ئەمین زەکی بەگ، خولاسەیەکی تەئریخی کورد و کوردستان، بنکەی ژین، سلێمانی -٢٠٠٦. بەدلیسی، شەرەفخان، شەرەفنامە، و. هەژار. چاپخانەی نوعمان، نەجەف-١٩٧٣. جومعە، بەدیع محەمەد (د. )، شا عەباسی گەورە(١٥٨٨- ١٦٢٩)، و. عەزیز گەردی. ناوەندی ئاوێر. هەولێر - ٢٠١٥. حەسەنخان - شاعیر و مێژوونووسی ناوداری کورد، چاپی یەکەم، بڵاوکراوەی ئاراس، هەولێر - ٢٠٠٦. ڕیچ، کڵۆدیۆس جەیمس، گەشتنامەکەی ڕیچ بۆ کوردستان - ١٨٢٠، و. محەمەد حەمە باقی، چاپی پێنجەم، بڵاوکراوەی موکریانی - ٢٠١٢. ڤاسیلیەڤا ی. ئی. ، کوردستانی خوارووی ڕۆژهەڵات - لە سەدەی حەڤدەوە تا سەرەتای سەدەی نۆزدەوە، کورتەیەکی مێژووی میرنشینانی ئەردەڵان و بابان. و. د. ڕەشاد میران، چاپی دووەم، بڵاوکراوەی ئاراس، هەولێر - ٢٠٠٩. ڤاسیلیێڤا ێ. ئی. ، کوردستانی باشوری ڕۆژهەڵات - لە سەدەکانی حەڤدەیەم - نۆزدەیەم، سەرچاوەیەک لەبارەی مێژووی میرنشینیە کوردییەکانی ئەردەڵان و بابانەوە. وەرگێڕانی لە ڕووسیەوە: د. ئارام عەلی، چاپخانەی کارۆخ، سلێمانی - ٢٠١٨. کۆمەڵێک نووسەر، چەند وتارێکی کوردناسی، ئەنوەر قادر محەمەد لە ڕووسییەوە کردوونی بە کوردی و پێشەکی و پەراوێزی بۆ نووسیون، بنکەی ژین، سلێمانی - ٢٠٠٨. کۆمەڵێک توێژەر، بیرئانینی مەستوورەی ئەردەڵان - شاعیر و مێژوونووسی ناوداری کورد، چاپی یەکەم، دەزگای چاپ و بڵاوکردنەوەی ئاراس، هەولێر - ٢٠٠٦. کردستاني، علي أکبر، الحدیقة الناصرییة في تأریخ و جغرافیا کردستان، ترجمة: جان دوست، دار ئاراس للطباعة و النشر، أربیل - ٢٠٠٢. ماه شەرەف خانم(مەستوورە)ی کوردستانی، مێژووی ئەردەڵان، و. د، حسن جاف و شکور مستەفا، چ ١، دەزگای ڕۆشنبیری و بڵاوکردنەوەی کوردی - ١٩٨٩. ماه شەرەف خانمی ئەردەڵانی، دیوانی مەستوورە، ماه شەرەف خانمی ئەردەڵانی. لێکۆڵینەوەی محەمەد عەلی قەرەداغی، دەزگای چاپ و بڵاوکردنەوەی ئاراس، جاپی یەکەم، هەولێر - ٢٠١١. مینۆرسکی، کورد، تێبینی و وردبوونەوە، د. مارف خەزنەدار لە ڕووسییەوە کردوویەتی بە عەرەبی، حمە سەعید حمەکریم کردوویەتی بە کوردی، لە بەڕێوەبەرێتی چاپخانەی زانکۆی سەلاحەدین چاپکراوە، هەولێر - ١٩٨٤. مینتیشاشڤیلی، ئا. م. ، کورد- کورتەی پێوەندیی کۆمەڵایەتی – ئابووریی، ڕۆشنبیری و گوزەران، و. پ.د. عیزەدین مستەفا ڕەسووڵ، چاپی دووەم، چاپخانەی موکریان، هەولێر - ٢٠٠٨. محەمەد حوسێن، لوڕستان لە سەفەرنامەی گەشتیاراندا، و. سەلاح نیساری، خانەی موکریانی بۆ چاپ و بڵاوکردنەوە، هەولێر - ٢٠١٣. مونشی بەغدادی، محەمەدی کوڕی ئەحمەد حوسێنی ، سەفەرنامەی مونشی بەغدادی لە تەک مستەر ڕیچدا(١٨٢٠)، و. ئەحمەد محەمەد ئیسماعیل، خانەی موکریانی، هەولێر - ٢٠١٤. نیکیتین، باسیلي، الکرد - دراسة سوسیولجیة و تأریخیة، نقله من الفرنسیة و علق علیه: د. نوري طالباني. مکتب الفکر و التوعیة (أوك)، السلیمانیة - ٢٠٠٦. Курдистани, Али Акбар Хронист, Сад Царства Насира. Пер. с перс. Е. И. Васильева. Ст. – Петербург- 2012. Мах- Шараф ханум Курдистани. Хроника дома Ардалан. Пер. с перс. Е. И. Васильева. Москва- 1990.
и впечатления (с приложением карты).Петроград, 1915. Хусрав ибн Мухамад Бани Ардалан, Хроника (История курдского княжского дома Бани Ардалан), пер. с перс. Е. И. Васильева. Москва –1984. MUSTAFA, Aram Ali. Mah Sharaf Khanoum Ardalani (Mastura Kurdistani), historian and author(1805- 1847); her life and her epoch. 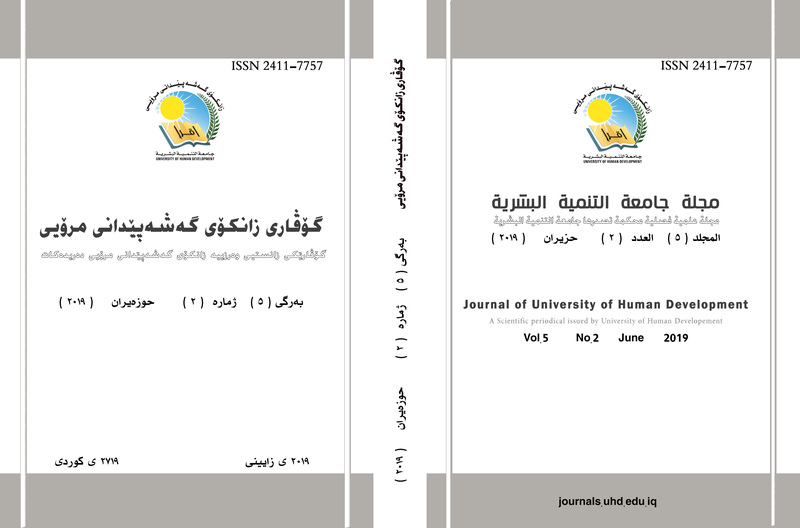 Journal of University of Human Development, [S.l. ], v. 5, n. 2, p. 1-12, apr. 2019. ISSN 2411-7765. Available at: <http://journals.uhd.edu.iq/index.php/juhd/article/view/267>. Date accessed: 21 apr. 2019. doi: https://doi.org/10.21928/juhd.v5n2y2019.pp1-12.